Modern "mad men" are buying into augmented reality for marketing, with the two latest examples being trendy burger maker Bareburger and department store chain Zara. And one of the leading social VR platforms wants to diversify its business with AR as well, and it has convinced investors to back development of its platform for AR. Finally, while most observers believe wearables are the future of the AR, Lampix's marketing executive begs to differ. Fast-casual burger restaurant Bareburger expects to one day replace all of its paper menus with 3D models of its burgers and other items rendered in augmented reality, but for now, the company is preparing some rather interesting limited AR interactions. The up-and-coming restaurant chain, framed by some as one of the hottest in the US, has partnered with augmented reality company Kabaq to soon recreate its entire menu in 3D and display those items in AR. Customers using Snapchat will be able to view the menu items by scanning corresponding Snapcodes. REALITY BITES: You've heard a lot about the AR cloud via Next Reality lately. Ori Inbar, founder and general manager of Super Ventures (among other AR enterprises), is one of the leading proponents of the AR cloud, and he took to Medium to recap the investment activity for the segment. Department store chain Zara is temporarily ditching its mannequins and dressing up its stores with augmented reality experiences featuring virtual versions of real fashion models. Rolling out to 120 of its flagship stores worldwide, customers inside and outside the stores can view AR activations through the Zara AR app for iOS and Android. 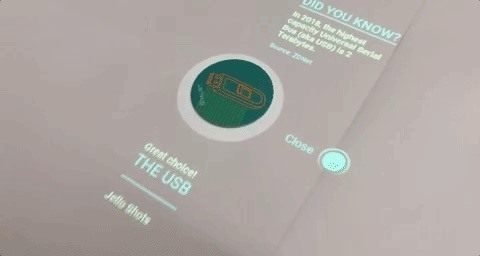 Store windows and in-store podiums, as well as shipping boxes for online orders, will display AR content when scanned. REALITY BITES: The GFR Fund, Super Ventures and The Venture Reality Fund are looking for a few good AR startups to meet with eager investors. Submit your company by April 23 to compete in the Global AR Online Pitch Event. Continue reading to learn what makes vTime's take on AR attractive to investors. REALITY BITES: Google gave its blog readers a behind-the-scenes look at its Demo Day startup event via Q&A with three female entrepreneurs, including Neha Singh, founder and CEO of AR/VR mobile commerce platform Obsess. The future of augmented reality isn't on your smartphone or face, it's in the everyday items all around us. At least that's the belief of Gordon Meyer, the vice president of marketing at New York-based startup Lampix. Meyer joined Next Reality editor Adario Strange recently on The Reality Pod podcast to talk about why he believes this is true.